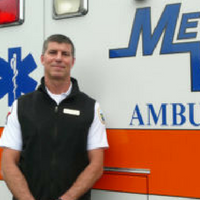 Harlan Brock has worked for Metro West Ambulance for over 11 years. Whether delivering babies or mentoring new paramedics and EMT’s, Harlan’s passion and dedication to EMS and Metro West Ambulance are demonstrated through his hard and tireless work. Harlan always leads by example and embodies Metro West’s core values of teamwork and dedication. This was demonstrated recently when he served as a volunteer member of a regional search and rescue effort to locate a missing girl in the Columbia River Gorge. Harlan reached out to local companies to coordinate supplies and resources needed for the search. Recently, Harlan and his partner were cleaning the ambulance after a transport to a local emergency department. All of a sudden, a shiny new Tesla came screeching into the emergency department bay. Harlan heard an ED technician shout, “There is a woman in labor in that car!” and sprang into action. Harlan quickly put on a fresh pair of gloves, safety glasses, and grabbed an obstetrical kit as he followed the technician to the passenger side of the Tesla. Soon after Harlan began his assessment, he recognized the patient was going to deliver soon. Minutes later, a healthy baby girl was delivered in the front seat of the car. Harlan is able to quickly assess and respond to situations with the resources necessary, to assure optimal patient outcome. Calm, professional, and caring, Harlan continuously demonstrates high-level, compassionate, clinical care to all of his patients. Harlan is loyal, honest, and committed to both his company and profession. Harlan rarely misses a day of work, fills in when necessary for his fellow medics, and continuously volunteers his time to make a difference. Metro West Ambulance is proud to honor Harlan as a 2017 Star of Life nominee.